Would be pretty neat if it actually did that. Obviously, these were all drawn in about 20-25 minutes each over the course of last week. I prefer to do quick drawings, because actually turning one of these into complete ‘paintings’ would probably take me all day. The devil’s in the details indeed. And there’s my primary workstation, the Mac Pro. I did a few sketches and ended up with stuff that looked more like a Jawa Sandcrawler from Star Wars, so after a few more drawings I found a look I really liked. Sort of like a jellyfish on your desk. 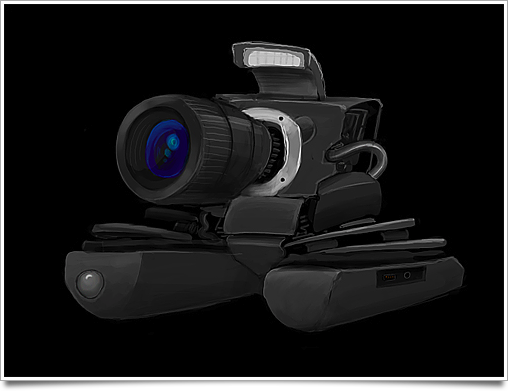 My Canon digital SLR camera made a good subject for the last speedpaint. I always wanted it to be smart enough to zip around on its own and follow me through the office so it’s there when I need it. Come on, Canon, just put some wheels in those side grips. It’d make for an excellent little transforming tank-camera combination. The airport (Which also looks somewhat like the laptop recharger brick) is extremely cool. Looks like the man hack from Half Life 2. The Mac Pro is also an interesting take. Either way, keep it up. These sort of re-works have always been interesting to me. I’m really digging the airport express robot head. I’d like to see that concept taken further. 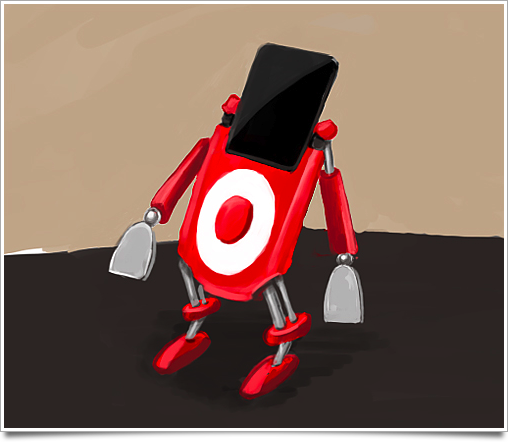 An army of nano-bots would also make for an interesting piece. What software did you use for these sketches? You should make that AirPort-Express-Bot into an icon! 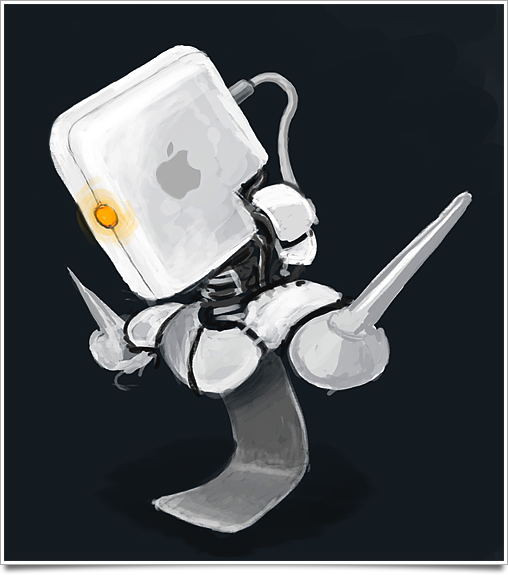 I’d love to use it as an Automator (or even Finder) replacement. Genius. Hopefully this inspires others to explore different concepts in their folder set solutions. Now all you have to do is actually create these as sculptures and have an exhibition. 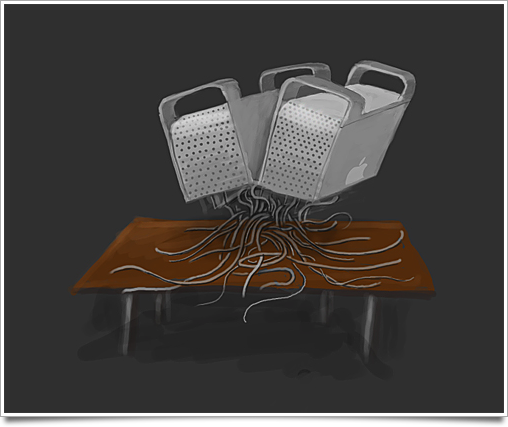 I’d definitely bid for a two-headed spaghetti legged mac pro! Wow, awesome. Agreed, it looks like the Portal turrent!